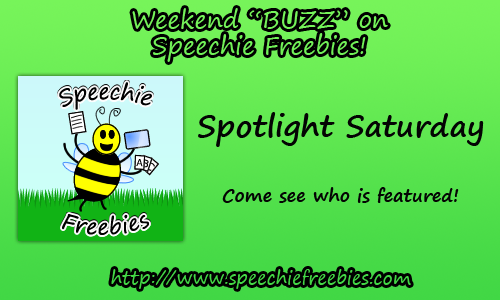 We're glad to have you back for our second Spotlight Saturday! This week, we are featuring Super Duper Publications! If you are a speech-language pathologist, you probably know this website very well for its educational and therapy products! Super Duper Publications was founded by Sharon and Thomas Webber in 1986 when Sharon started creating materials for her own practice as a speech-language pathologist in the public schools. They started with two products and two sets of stickers, and now they have over 100 products! Not only do they sell great products on their website, but they are generous enough to offer free printable materials, handouts, and apps! They also offer daily printable worksheets and discounts on their social media accounts! The free content on Super Duper Publications' website helps speech-language pathologists to continue their education, educate parents/clients/caregivers, and use fun therapy activities in their practices! Speech-language pathologists are required to get 30 hours of continuing education every three years. Many of the continuing education workshops, conferences, and webinars are costly. However, Super Duper Publications can save speech-language pathologists some money with their free CEU recorded/live webinars. Many are based on their products but provide insight into areas in the field including RtI, applications on tablet devices, and more! Three free materials which help when writing reports, are the age calculator, case history form, and response analyzers. The age calculator is available online on Super Duper Publication's website as well as as an application for your mobile device. The case history form is printable from their website as a downloadable PDF file. Finally, response analyzers are available for six different assessments that Super Duper Publications sells (CPAC-S, ELLA, MAVA, MOST, SEE, and WABC). There are other free applications for Android and Apple devices available on the application stores. Some of these include the Let's Name Things Fun Deck, Using I and Me Fun Deck, and samples of their Photo Articulation Castle, WH Question Cards, Common Core Vocabulary, and HearBuilder Phonological Awareness apps. To help educate clients, parents, and caregivers about various speech-language disorders, Super Duper Publications offers free handouts which provide information about various disorders, assessment, diagnoses, associated disorders, and how to help educate clients who have various difficulties in over 400 Handy Handouts. Topics of these handouts range from teaching children about internet safety to word recognition to differential diagnosis of autism spectrum disorders. These are great for speech-language pathologists to keep in their offices or print from their computers and most are available in both English and Spanish languages. Finally, don't forget to follow Super Duper Publications on various social media to receive daily (M-F; usually up to 20%) and weekly discounts (sometimes up to 50%) on products as well as daily (M-F) free worksheets to use in therapy! You can follow them on Facebook, Twitter, Pinterest, and YouTube! Plus, if you are reading this on the date this article was posted (March 15th, 2014) they are selling many of their products at zulily.com for a huge discount (through March 17th, 2014)! They have sold products at a discount on this website in the past as well, so keep your eyes open! In addition, be sure to check their website around Better Hearing and Speech Month as well as the beginning of the school year and at conventions for discounts on most of their products!